in times when new smartphone models drop every year, it’s not uncommon, that your “old” one gets dusty in a drawer. We thought of a reasonable use for your old smartphone, which not only saves you money, but also keeps the planet a little cleaner. 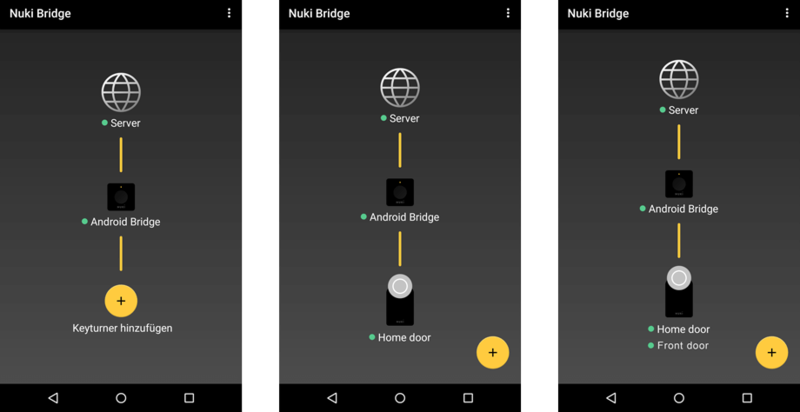 We developed the Nuki-Bridge-App. Yes, it’s an app! Ignited by reaching our 300.000€ goal on Kickstarter, we kept our promise and will release the Nuki-Bridge-App alongside Nuki. Thanks a lot again, to all our backers! An infinite number of Nukis can be connected to a single bridge. Nuki communicates via internet with our servers. These servers, just like your bridge, don’t store any data, because your data already is sent in encrypted form from your Nuki. The Bridge-App also comes with an interface that shows you how many Nukis are connected in your reach. What’s the difference between the soft- and the hardware Bridge? If you do not have WiFi in your home, you can simply use your smartphones mobile data connection. One locking process needs less than a kilobyte and a status check even less. So your data-volume won’t be expended by Nuki and you could even use a prepaid data-only SIM to compensate for your missing WIFI. We also have good news for all of you, who plan to use the REST-API. The Android-Bridge-App also provides a REST-API for status checks and locking processes which makes it an ideal starting point for your own projects. The Nuki-Bridge-App is free for all our Kickstarter-Backers and will be offered to all our other Nuki-Fans for free as well. Once again we’d like to thank all our Kickstarter-Backers for making Nuki possible, and for helping us to reach the Nuki-Bridge-App goal, which is now becoming a reality for all the Nuki Fans out there.